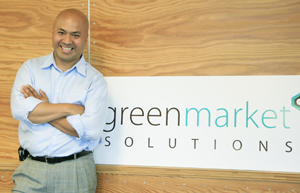 “I’m a social worker at heart,” says Neville Mercado, President of GreenMarket Solutions, a Beaverton-based firm that specializes in cost effective, green and sustainable products and services for a wide array of agricultural development and construction projects. Mercado, raised by an affluent family in a rural community in the Philippines, says that his green outlook stems from seeing and experiencing first-hand the living conditions in developing countries, as well as his experiences as a young man in San Francisco. “I grew up in small town south of Manila, San Pablo, Laguna. Growing up, my family owned a plantation, so we were doing okay. But the kids that I grew up with had dirt floor, grass roof and cooked on an open fire,” he said. Through effective and environmentally-safe products and services for soil stabilization, soil optimization, contaminated soil remediation, organic waste clean-up, and agricultural development, Mercado and his team are blazing new trails in the green frontier. In his own words, Mercado shares his journey from growing up in rural Philippines to coming of age in San Francisco and his present passion for promoting environmental stewardship. I came to the United States when I was 10, when my family moved to San Francisco. My parents worked as a pharmacist and biologist. My father worked for the Philippine Secretary of Agriculture for a few administrations. In San Franscisco, he worked for the Mayor’s office, reporting to Dianne Feinstein, who is now a U.S. Senator. In college, I wanted to go to design school and move to New York, but my folks thought I should be an engineer. I happened upon a job doing research for a real estate appraisal firm. At age 19, I was a commercial appraiser in San Francisco, driving around in my motorcycle and cruising through traffic. That was my rebellious time. I learned the ropes of real estate at an early age. Around 1988, I recognized that the California real estate market was starting to slow down. I decided that I really needed to go back to school and finish my degree. I started attending the University of Oregon, majoring in architecture. After I got my degree, I tried for a while to make it as an architect. I already had a lot of responsibilities, so I decided to go about it a different way. I started designing and building properties. With my background in architecture and real estate appraisal, I became relatively successful at doing that. My interest in architecture and property development got me interested in Green Market Solutions. We’re not just out there selling or providing a service. We have solutions for some of the most basic environmental problems. The products we manufacture and market are very innovative. The first thing we do is to educate folks about what we’re about: we offer non-toxic products that promote environmental stewardship. What’s kind of neat is discovering that everybody has a certain sense of green-ness. There is a trend toward more awareness about why it’s important to have a greener and sustainable world. Our products have been well-received in many rural parts of the country, and in Asia and Latin-America. 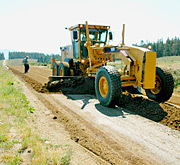 Our products are used in remediation and restoration of rural county roads. In Grand County, Colorado, for example, we were successful in restoring a one-mile road for soil stabilization and dust control. In a rural Oregon community, we helped with problems with drain fields. Homes constructed homes on clay soil were not draining properly. We looked at the problem, and proposed a simple, inexpensive solution. For that project, we treated the whole tank with biowaste digestible products that cleans the tiling that leads to the drain field. This allows for proper drainage, while at the same time reconditioning the soil to promote natural drainage. 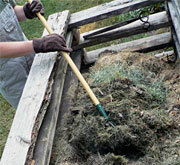 By using green products to condition soil, we enabled native bacteria growth that eventually consumes the sludge and slurry that is clogging up the soil. Everything we do is soil and groundwater – from road construction to soil stabilization to environmental cleanup, wastewater cleanup. We have products for agricultural development. In developing countries, one of the concerns we’ve identified is groundwater cleanup. In the Philippines, for example, we came to find out that one of the biggest problems is contaminated water. 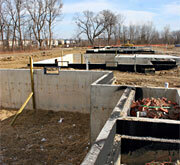 About 80% of the homes are on septic system. What started happening is that the sewer system consists of creeks and rivers. Anywhere we go, we want to make sure that we are making a difference. What do I like most about my work? I like being an ambassador and helping educate people. I’m finally in a position where I’m doing something to make a difference, and be able to sustain myself doing it. The success of Green Market Solutions is dependent upon the strength of our team. It’s really a team effort. I’m the big, creative idea guy, but I also have a team that is able to look at the ideas and figure out how to implement them. Having a team behind you that’s able to do that is key. We’re all working together toward the same goal: making a difference and promoting environmental stewardship.